Recognize chemical reactions as single-replacement reactions and double-replacement reactions. Use the periodic table, an activity series, or solubility rules to predict whether single-replacement reactions or double-replacement reactions will occur. Up to now, we have presented chemical reactions as a topic, but we have not discussed how the products of a chemical reaction can be predicted. Here we will begin our study of certain types of chemical reactions that allow us to predict what the products of the reaction will be. Here the negatively charged ion changes from chloride to fluoride. A typical characteristic of a single-replacement reaction is that there is one element as a reactant and another element as a product. will not because bromine is below fluorine on the periodic table. This is just one of many ways the periodic table helps us understand chemistry. The halogens are the elements in the next-to-last column on the periodic table. Will a single-replacement reaction occur? If so, identify the products. MgCl2 + I2 → ? CaBr2 + F2 → ? Because iodine is below chlorine on the periodic table, a single-replacement reaction will not occur. Because fluorine is above bromine on the periodic table, a single-replacement reaction will occur, and the products of the reaction will be CaF2 and Br2. FeI2 + Cl2 → ? Chemical reactivity trends are easy to predict when replacing anions in simple ionic compounds—simply use their relative positions on the periodic table. However, when replacing the cations, the trends are not as straightforward. This is partly because there are so many elements that can form cations; an element in one column on the periodic table may replace another element nearby, or it may not. A list called the activity series does the same thing the periodic table does for halogens: it lists the elements that will replace elements below them in single-replacement reactions. A simple activity series is shown below. 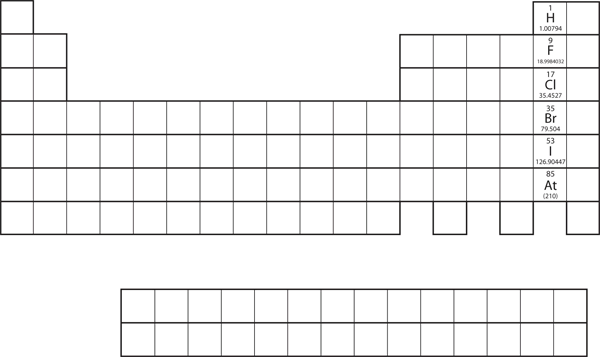 Using the activity series is similar to using the positions of the halogens on the periodic table. An element on top will replace an element below it in compounds undergoing a single-replacement reaction. Elements will not replace elements above them in compounds. Use the activity series to predict the products, if any, of each equation. FeCl2 + Zn → ? HNO3 + Au → ? Because zinc is above iron in the activity series, it will replace iron in the compound. The products of this single-replacement reaction are ZnCl2 and Fe. Gold is below hydrogen in the activity series. As such, it will not replace hydrogen in a compound with the nitrate ion. No reaction is predicted. Use the activity series to predict the products, if any, of this equation. AlPO4 + Mg → ? There are two equivalent ways of considering a double-replacement equation: either the cations are swapped, or the anions are swapped. (You cannot swap both; you would end up with the same substances you started with.) Either perspective should allow you to predict the proper products, as long as you pair a cation with an anion and not a cation with a cation or an anion with an anion. Predict the products of this double-replacement equation: BaCl2 + Na2SO4 → ? Thinking about the reaction as either switching the cations or switching the anions, we would expect the products to be BaSO4 and NaCl. Predict the products of this double-replacement equation: KBr + AgNO3 → ? Predicting whether a double-replacement reaction occurs is somewhat more difficult than predicting a single-replacement reaction. However, there is one type of double-replacement reaction that we can predict: the precipitation reaction. A precipitation reaction occurs when two ionic compounds are dissolved in water and form a new ionic compound that does not dissolve; this new compound falls out of solution as a solid precipitate. The formation of a solid precipitate is the driving force that makes the reaction proceed. To judge whether double-replacement reactions will occur, we need to know what kinds of ionic compounds form precipitates. For this, we use solubility rules, which are general statements that predict which ionic compounds dissolve (are soluble) and which do not (are not soluble or insoluble). Table 4.1 “Some Useful Solubility Rules” lists some general solubility rules. We need to consider each ionic compound (both the reactants and the possible products) in light of the solubility rules in Table 4.1 “Some Useful Solubility Rules”. 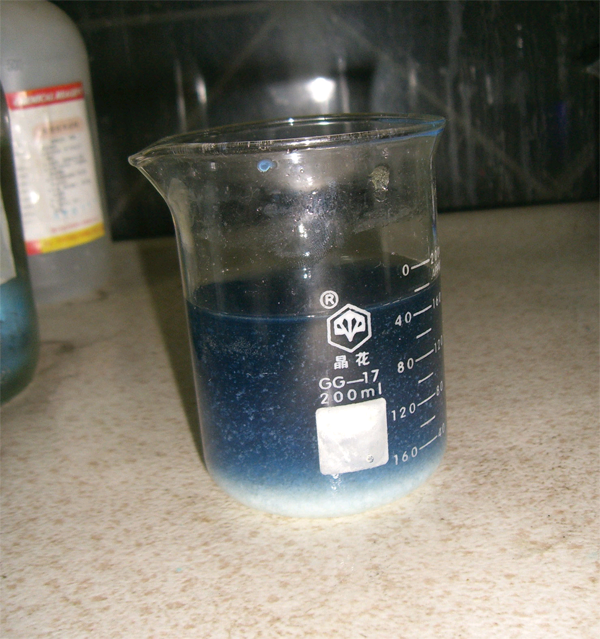 If a compound is soluble, we use the (aq) label with it, indicating it dissolves. If a compound is not soluble, we use the (s) label with it and assume that it will precipitate out of solution. If everything is soluble, then no reaction will be expected. You would expect to see a visual change corresponding to SrSO4 precipitating out of solution (Figure 4.2 “Double-Replacement Reactions”). Some double-replacement reactions are obvious because you can see a solid precipitate coming out of solution. Source: Photo courtesy of Choij, http://commons.wikimedia.org/wiki/File:Copper_solution.jpg. Will a double-replacement reaction occur? If so, identify the products. Ca(NO3)2 + KBr → ? NaOH + FeCl2 → ? According to the solubility rules, both Ca(NO3)2 and KBr are soluble. Now we consider what the double-replacement products would be by switching the cations (or the anions)—namely, CaBr2 and KNO3. However, the solubility rules predict that these two substances would also be soluble, so no precipitate would form. Thus, we predict no reaction in this case. Will a double-replacement equation occur? If so, identify the products. Sr(NO3)2 + KCl → ? No reaction; all possible products are soluble. A single-replacement reaction replaces one element for another in a compound. The periodic table or an activity series can help predict whether single-replacement reactions occur. A double-replacement reaction exchanges the cations (or the anions) of two ionic compounds. A precipitation reaction is a double-replacement reaction in which one product is a solid precipitate. Solubility rules are used to predict whether some double-replacement reactions will occur. What are the general characteristics that help you recognize single-replacement reactions? What are the general characteristics that help you recognize double-replacement reactions? Assuming that each single-replacement reaction occurs, predict the products and write each balanced chemical equation. a) Zn + Fe(NO3)2 → ? b) F2 + FeI3 → ? 4. Assuming that each single-replacement reaction occurs, predict the products and write each balanced chemical equation. a) Li + MgSO4 → ? b) NaBr + Cl2 → ? 5. Assuming that each single-replacement reaction occurs, predict the products and write each balanced chemical equation. a) Sn + H2SO4 → ? b) Al + NiBr2 → ? 6. Assuming that each single-replacement reaction occurs, predict the products and write each balanced chemical equation. a) Mg + HCl → ? b) HI + Br2 → ? 7. Use the periodic table or the activity series to predict if each single-replacement reaction will occur and, if so, write a balanced chemical equation. a) FeCl2 + Br2 → ? b) Fe(NO3)3 + Al → ? 8. Use the periodic table or the activity series to predict if each single-replacement reaction will occur and, if so, write a balanced chemical equation. a) Zn + Fe3(PO4)2 → ? b) Ag + HNO3 → ? 9. Use the periodic table or the activity series to predict if each single-replacement reaction will occur and, if so, write a balanced chemical equation. a) NaI + Cl2 → ? b) AgCl + Au → ? 10. Use the periodic table or the activity series to predict if each single-replacement reaction will occur and, if so, write a balanced chemical equation. a) Pt + H3PO4 → ? 11. Assuming that each double-replacement reaction occurs, predict the products and write each balanced chemical equation. a) Zn(NO3)2 + NaOH → ? b) HCl + Na2S → ? 12. Assuming that each double-replacement reaction occurs, predict the products and write each balanced chemical equation. a) Ca(C2H3O2)2 + HNO3 → ? b) Na2CO3 + Sr(NO2)2 → ? 13. Assuming that each double-replacement reaction occurs, predict the products and write each balanced chemical equation. a) Pb(NO3)2 + KBr → ? b) K2O + MgCO3 → ? 14. Assuming that each double-replacement reaction occurs, predict the products and write each balanced chemical equation. a) Sn(OH)2 + FeBr3 → ? b) CsNO3 + KCl → ? 15. Use the solubility rules to predict if each double-replacement reaction will occur and, if so, write a balanced chemical equation. b) K2O + Na2CO3 → ? 16. Use the solubility rules to predict if each double-replacement reaction will occur and, if so, write a balanced chemical equation. a) Na2CO3 + Sr(NO2)2 → ? b) (NH4)2SO4 + Ba(NO3)2 → ? 17. Use the solubility rules to predict if each double-replacement reaction will occur and, if so, write a balanced chemical equation. a) K3PO4 + SrCl2 → ? b) NaOH + MgCl2 → ? 18. Use the solubility rules to predict if each double-replacement reaction will occur and, if so, write a balanced chemical equation. a) KC2H3O2 + Li2CO3 → ? b) KOH + AgNO3 → ? 1. One element replaces another element in a compound. b) 3 F2 + 2 FeI3 → 3 I2 + 2 FeF35. Types of Chemical Reactions: Single- and Double-Displacement Reactions by Jessie A. Key is licensed under a Creative Commons Attribution-NonCommercial-ShareAlike 4.0 International License, except where otherwise noted.